This is the lazy persons way of roasting winter squash and it ain’t half bad! Instead of scooping out the seeds (or god forbid peeling the damn thing) I just sliced her up, drizzled everything in a little olive oil, tossed in some herbs and garlic, and then with a heavy hand, sprinkled some freshly grated parmesan cheese for good measure. I’m not sure if many of you know this but the skins on winter squash are edible. Some are more tender than others but all in all, they’re fine to eat and can offer another flavor and texture to your dish. What I love about roasting the squash with the seeds intact is that they crisp up and taste great on their own or enjoyed with the roasted squash. One thing I found was that not all of the seeds browned up evenly so after I removed the squash from the oven I returned the pan back with a few of the seeds that needed a bit more time. Regardless, this method is easy and you’re more likely to roast those seeds that I know you always plan to cook but more times than not probably toss out. 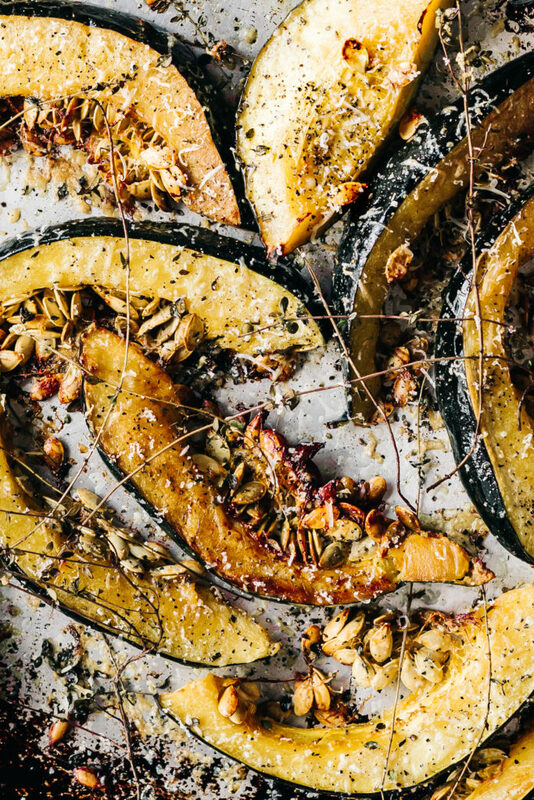 On a rimmed baking sheet toss the squash (seeds and all) with the garlic, herbs, salt and pepper and drizzle with plenty of olive oil. Place in the oven and roast until the squash is fork tender and the seeds are browning up, about 25-30 minutes. Flip the squash halfway through cooking and at this time sprinkle on the parmesan cheese. Remove the squash from the oven and if desired sprinkle on a little more parmesan cheese for good measure. Why didn’t I think of this?! Great idea. I saw on instagram that you dice and freeze bell peppers. I am so curious -how do you do that? Have not tried or heard of that before. Love this post for acorn squash. This is a great idea. Life is too short to peel squash. Especially when the skin is so good and the seeds are like crunchy candy. this was amazing!!!! I couldn’t believe the flavor packed in these little slivers of squash- and we didn’t even use cheese because we didn’t have any on hand!